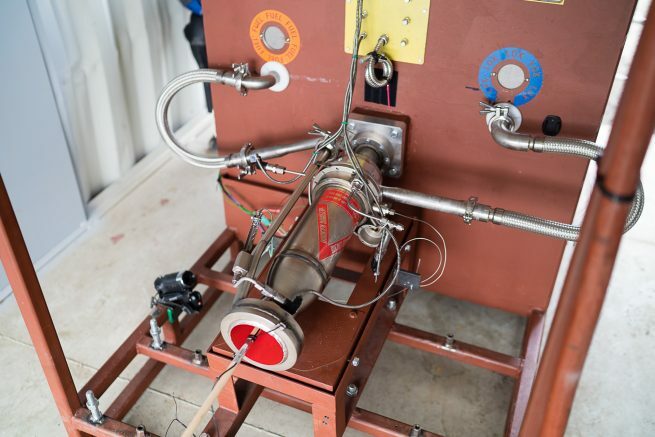 Copenhagen Suborbitals have published a new blog post on what has been happening recently at their workshop, putting a new an old and new BPM-5 engine through its paces. Commissioning of the new engine with a 7 second mainstage burn, at 15 bar chamber pressure. One more test using the new engine, same parameters as the first test, apart from the use of nitrogen instead of helium as pressurisation gas. As you may know, helium is rather expensive, we can save a fair amount of money using nitrogen. The interesting point here is whether using nitrogen will impact performance. Last test using the new engine, again using nitrogen. For this test we deliberately let the tank stay pressurised for 5 minutes. This gave the nitrogen time to mix with the oxygen, a worst case scenario test of the feasibility of the use of nitrogen as pressurisation gas. Commisioning of a new injector, injector #3. Until now all tests (even the Nexø I flight) have been performed using injector #2. It was about time to test one of the new injectors. For this test Franken 5 was put into service again. Record attempt with Franken 5. More details on this later. The team went away from metal spinning for Jop’s engine and had a CNC nozzle machined and then welded onto the chamber, thus giving tighter tolerances. And of course of the note, the team conducted a 33-second burn of the Franken 5 engine using upgraded capacity test stand tanks. These tanks now emulate the tank size of the Nexo series of rockets. For the final test of the day we let a bit of amusement park feeling enter the test area … We have upgraded the test stand tanks from 33 liters to 66 liters as a prerequisite for our test of the student engine, and the tanks now have the same volume as the Nexø I and Nexø II tanks. And no, I have no idea why CS design tanks in 33 liter increments. The larger tanks lends us opportunity to perform looong tests, and Sunday we wanted to set a new record. For this we loaded 48 kg of ethanol and 62 kg of LOX in the tanks! A sort of preview of the expected Nexø II performance next summer on the Baltic Sea. This resulted in an approximately 33 second long burn, about twice as long as Franken 5’s former record. A total of 182,000 N-s delivered with an ear splitting, almost infinite roar. Pure bliss, resulting in cheshire cat grins all over Mission Control. No word on the injector difference between #2 and #3, would be interesting to know this, whether it is a completely new orifice pattern or just more accurately machined, or something else.